FAD Tools International - What Are FAD Tools? Fad Tools is a collection of three foundation design modules used to design and analyze foundations for transmission line structures. Each module is based on a semi-empirical models developed from full-scale foundation tests and calibrated for Reliability Based Design (RBD). MFAD designs and analyzes drilled shaft and direct embedded pole foundations subject to high overturning loads (moment and horizontal shear) and axial loads. 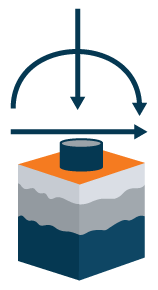 Overturning loads are resisted by a combination of lateral pressure, vertical shear forces, base shear and moment. MFAD uses a Load Resistance Foundation Design (LRFD) method and models multi‐layered soil and rock subsurface conditions. MFAD uses a four spring model to resist the applied loading. MFAD springs can be turned on/off to model various soil–structure interaction conditions. MFAD results include nominal and design capacities. MFAD includes performance criteria for total rotation and deflection and non‐recoverable rotation and deflection. MFAD is calibrated with full‐scale load test of both direct embedded pole and drilled shaft foundations. HFAD designs and analyze drilled shaft and direct embedded foundations for H‐frame steel pole structures. HFAD models a foundation subjected to a combination of overturning loads (moment and horizontal shear) and uplift compression or shear loads. HFAD uses a Load Resistance Foundation Design (LRFD) method and models multi‐layered soil and rock subsurface conditions. HFAD results include nominal and design capacity. TFAD designs drilled shaft foundations for lattice tower structure legs. TFAD models a foundation subjected to a combination of horizontal shear under uplift or compression loads. TFAD uses a Load Resistance Foundation Design (LRFD) method and models multi‐layered soil and rock subsurface conditions. TFAD results include nominal and design capacity. The TFAD cylindrical shear model is calibrated with full-scale Uplift load tests.